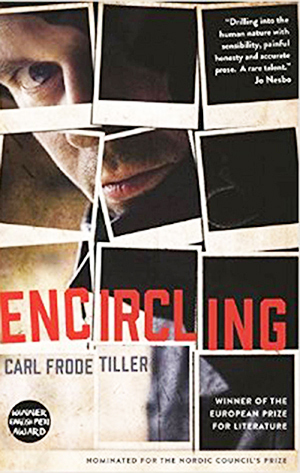 The conceit alone of Carl Frode Tiller’s The Encircling Trilogy is brilliant: David, thirtysomething, has lost his memory, so he places an ad throughout Norway asking anyone who recognizes him to send letters sharing memories so he can cobble together a portrait of himself. The idea crackles with electric possibilities, and Tiller’s execution is perfect. The first book in the trilogy, Encircling, was published in Norway in 2007 to raucous acclaim and numerous awards. It was released in America in 2016 by Graywolf Press. Encircling 2: Origins was published in Norway in 2010 and was released here this past March. The third, published in Norway in 2014, is slated for the spring of 2020. Each book is broken into three sections, and each section is devoted to one character, his or her current life interspersed with his or her letter to David. In the first book, the three characters are two of David’s closest teenage friends and his stepfather, a retired vicar of the local church. This second book probes David’s younger years through three different characters: Ole, a struggling farmer and grammar-school playmate of David’s; Tom Roger, a hardscrabble, violent man who was an unlikely middle-school friend of David’s; and Paula, an aged woman who was a close friend of David’s mother and has some explosive secrets. While not necessary, reading the books in order offers a richer, more rewarding experience. That macho culture leads to a violent society, and Ole works to keep violence out of his own life. It is violence that lies at the center of his memories with David, specifically a childhood game out in the woods that spiraled out of control. The second section is narrated by Tom Roger, a slave to rage and violence who revels in his brutal nature. People fear him, and he’s gratified they do. His grandfather is a junk dealer with a criminal past, his mother is a malcontent who takes shrewd delight in harming others, and Tom Roger himself is a sometimes mechanic with his own criminal past, one that he shares with David. Tom Roger’s section is fueled by classism, and it is Tom Roger’s sense of inadequacy from his lower-class status that fuels his violence and rage. Classism is also what compels Tom Roger to write David. David’s mother married the local vicar, and as a result of that union, David enjoyed a solidly middle-class life—a good home, a good education, a reputable circle of friends. But it wasn’t always that way for David, nor for his mother, nor especially for his grandfather whose life was intricately involved with the life of Tom Roger’s criminal grandfather. By the end of Tom Roger’s section, we’re still not sure who David’s father is, but we know who his grandfather is, and it’s not someone we would have expected. The final section is narrated by Paula, an elderly woman in a nursing home who, on that day, is visited by her son and grandson, Odd Kare and Johnny. It’s a rare visit, and it does not go well, but it couldn’t. Paula has a dark and painful secret about her relationship with her son, the kind that makes a good relationship impossible, and she also has a dark secret about David and his mother, Berit, who’d been her close friend for years despite the difference in age. In her letter to David, she reveals that secret about his mother, a revelation that is the surprising yet logical conclusion of this volume, for while Encircling 2: Origins, is about violence and class and conformism and hypocrisy, it is more than anything else about parenthood. Very near the conclusion of Tom Roger’s letter to David, he addresses why he took the initiative to write and admits, “But mostly I think it’s just that my ma’s and your mother’s stories have something relevant to say about us, you and me.” Indeed, they do. This book and its predecessor are marvels. They have the allure and drive of a good mystery and yet are much more than mere whodunnits. They are rich, complex, and fiercely compelling books of stories within a story, a compilation of everyday people leading everyday lives while buried within are haunting family secrets that simultaneously guide the plot while continuing to sketch a composite of the mystery character at the center of it all—David, a guy who just wants to know who exactly he is, something the other characters in these books, and very likely many of us readers, are sometimes in search of ourselves. Originally from rural Illinois, Erik Simon is a writer, screenwriter and consultant currently living in the New York area. He is the author of the novel Don Prophet and the young adult novel Bunny Jones.